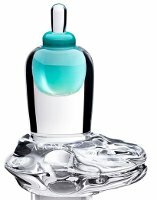 Swedish niche line Agonist Parfums has launched four new fragrances in art-glass bottles: Arctic Jade, Vanilla Marble, Onyx Pearl and Black Amber. Arctic Jade (shown) ~ "Inspired by the frozen arctic icescapes this edition capsulates a fresh jewel of Parfum made of 100% natural ingredients." With notes of orange, freesia, bilberry, jasmine, white cedar, ylang ylang, framboise, sandalwood, ambrette, vanilla and patchouli. Vanilla Marble ~ "A creamy addictive deep Vanilla. This 100% natural fragrance awakens your deepest joyful childhood memories and takes you on a sensous [sic] journey through time." With vanilla, almond, tiare, orchid, white fig, amber, patchouli, sandalwood, vanilla, benzoin and tonka bean. Onyx Pearl ~ "Inspired by the intriguing visual imagery of Guy Bourdain this flacon holds a suggestive and vibrant composition of 100% natural fragrance using the finest raw material." Featuring lavender, cardamom, lemon, green tea, myrrh, violet and tonka bean. Black Amber ~ "This fragrance takes you on a journey into the deep ambery core of the forest. With a unique composition of 100% natural ingredients this fragrance expresses the enchanting essence of wood and amber." The notes include incense, pruno, red algae, davana, labdanum, vetiver, tobacco blossom, Atlas cedar, cyprio, patchouli, black amber, vanilla, styrax and sandalwood. “Red algae”? Well, that’s a new one. Hard to imagine what it’s doing in the core of the forest, though. Of the four, Black Amber is the one I’d try, if I didn’t know how ungodly expensive Agonist scents are. Even for niche, and even in those luscious bottles, they’re really pricey. It was in Reminiscence Sea Rem earlier this year, but I think that’s the only other time I’ve seen red algae. And their website didn’t list the prices, but yeah, they’re likely to be astronomical. That Arctic Jade immediately reminded me of a baby bottle! Black Jade sounds interesting but not at the horrendously expensive price of Agonist. About the only thing I’d pay that much to sniff from Sweden would be Alexander Skarsgaard! Me too, although I still think it’s lovely. The other 3 are gorgeous too; worth going over there to take a peek. He has improved with age…check him out as Eric Northman in True Blood. I die…. I don’t even want to smell these because at least two of them sound really lovely and I’m afraid to even guess at the price. Xendawg: haha! Agonist is talking PRUNE (as in the dried fruit)! Prune = pruneau in French (not pruno) LOL! Did you read the poem by Jarvis Masters? Pretty powerful, in a way. We must have different red algae-its quite poisonous here! Black Amber sounds nice.I would love to see all the bottles. Debbie, just click on the link to their website at the end of the article above. Black Amber is the one I would want to try, and I love the bottle! I am really afraid of these – I ordered samples of The Infidels and LIquid Crystal from LS and fell in love with both of them. If I could find where the kittens hid my sample of The Infidels, I would wear it for Christmas. Oh god. I really want to try Vanilla Marble. Though the name and bottle (I looked at their site) are heinous. It sounds like exactly what Im looking for. Ive never been a gourmand or vanilla person, but the last few weeks, I have been on an absolute QUEST for a vanilla that I love. Feel free anyone to point me in the direction of an old discussion of vanillas, I know there’s been some on here, just can’t recall what or when. Happy Holidays Ladies and Gents! Oh big duh on my part, I forgot we could search tags… thanks Robin as usual!! merry Christmas everyone! Unfortunately we are not as good about tagging posts as we should be! But at least it’s someplace to start. Merry Xmas to you too! Lucky for my bank account, my two favorites (Arctic Jade and Vanilla Marble) each have something off-putting in them. Arctic Jade has cedar, which I amp up, and Vanilla has white fig. I’ve had my fill of fig fragrances, overfill in fact, so I can easily pass them up. The actual fragrances sound intriguing and I like the bottle part of the bottles, but the bases of the bottles make it look like the whole thing is sinking into the primal ooze.